Spoleto – 349 North Orlando Avenue Winter Park. As we all know eating out can be expensive, and customers are perpetually striving to find a value for money experience, and food made with fresh ingredients but without compromising on quality. We set ourselves a benchmark of $20 without drinks and before tax to cover a meal for two, and starting this month will feature our “Target Twenty” suggestions and recommendations. The first to qualify for this accolade is Spoleto Italian Kitchen, and in particular our local restaurant on Orlando Avenue, which we have driven past a thousand times, but never thought to visit until now. Set back from Orlando Avenue, Spoleto provides internal seating and counter style options as well as a patio to the front of the building. Service is simple and effective, just choose your Pasta variety, add up to Six ingredients from their “Certified Organic” range of options, add your Sauce, then Finish it off with cheese or herb garnishes. The dish is cooked fresh right in front of you and the pasta is only “Fired” when your order is taken so no gloopy and sticky pasta here. You can of course add items such as Shrimp or a Giant Meatball to make it extra special at a very reasonable additional cost, or choose from the “Chef Inspired” recipes that combine ingredients in perfect balance. The quality of both these pasta dishes far exceeded their price point, which was really unexpected from such a simple concept, it goes to show that fresh ingredients will shine through when treated with respect and do not have to leave a large hole in your pocket book. Although the above meals were plenty for lunch and fell below our $20 budget coming in at $19, we had to try the flatbread. 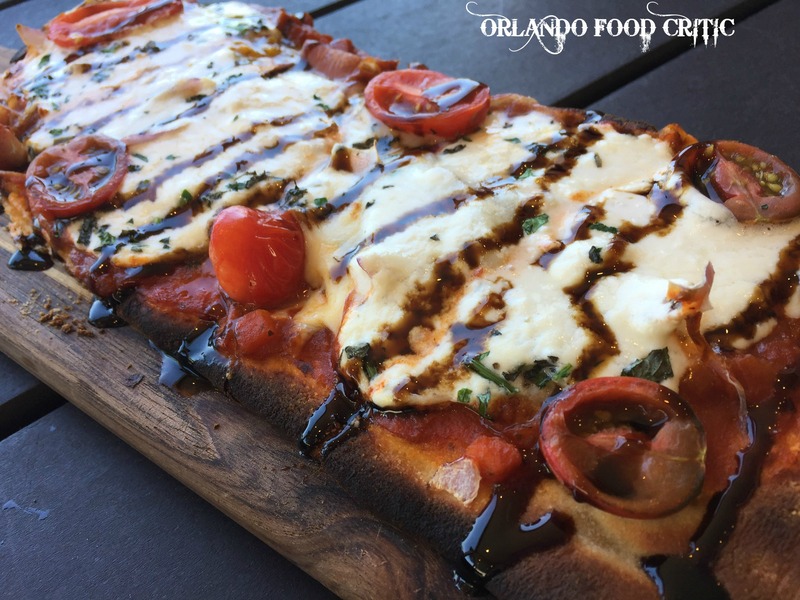 We went for the Burrata & Prosciutto Caprese – Burrata cheese, prosciutto, cherry tomatoes, red onion, marinara, Italian herb blend, Italian cheese blend and drizzled with balsamic glaze. $10. The creamy Burrata combined perfectly with the sweet cherry tomatoes and was creatively spiced up with a rich tang from the balsamic glaze. Spoleto also have a Wine and Craft Beer selection and “Bambino Menu” that are as value oriented as the other food offerings and in terms of desserts we believe the “Nutella Flatbread” is the way to go (save that for another time). 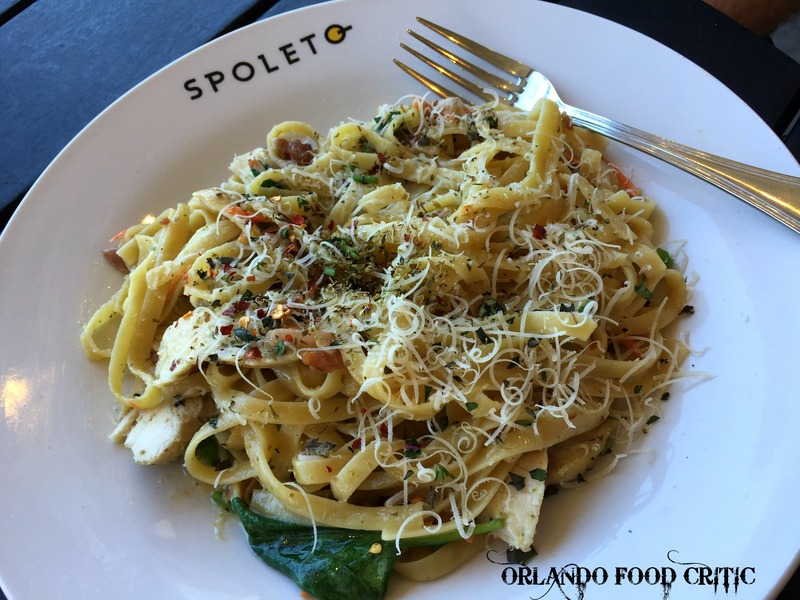 Service was speedy and very friendly, counter service can sometimes be somewhat robotic but the team at Spoleto really made you feel welcome, explaining the service style, ingredients and options in a knowledgeable and relaxed manner. So, to sum this all up, we hit our budget figure coming in at $19 for the two meals (prices correct at time of posting) and we also had a great lunch made from fresh ingredients and experienced superb service. Keep it up Spoleto you have made a fan of the OFC!